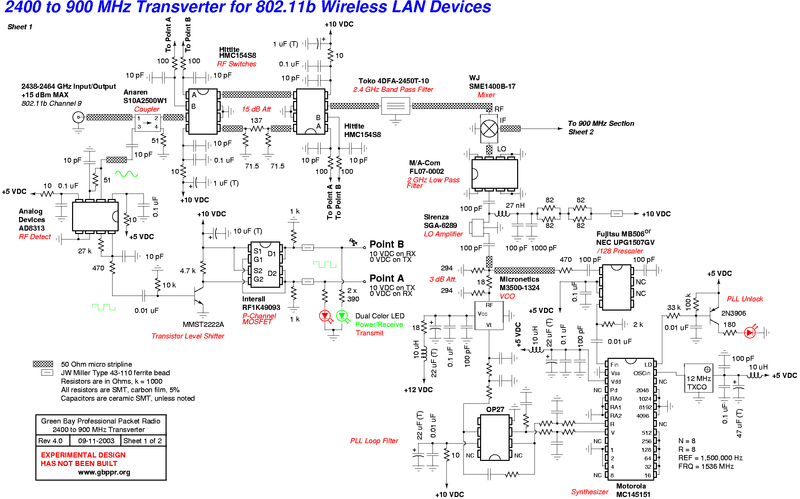 Is it possible to convert an off-the-shelf 802.11b wireless LAN device operating in the 2400 MHz Part 15/Part 97 band down to the 915 MHz Part 15/Part 97 band? I don't know. This might help overcome non line-of-sight issues most people are facing today. 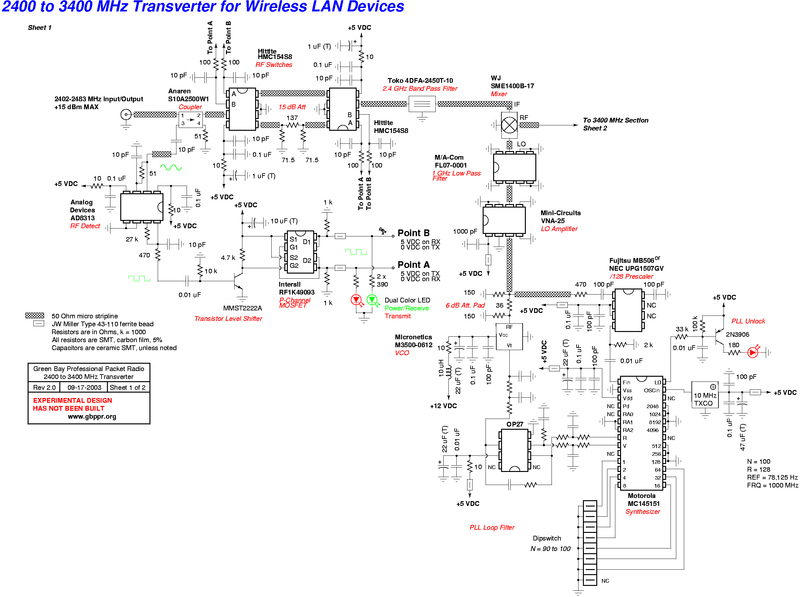 Fairly high antenna gain and RF output power should reduce the multipath conditions which degrade wireless data links. The theory is to mix 802.11b channel 9 (2451 MHz) with a local oscillator frequency of 1536 MHz. The resulting IF frequency is 915 MHz, which is the new transmit/receive frequency. You then will do a little dance to the Gods to keep pagers and cellphones from destroying all your hard work. The actual bandwith of the RF signal of the final direct sequence spread spectrum signal is 22 MHz wide, between 904 and 926 MHz - centered at 915 MHz. You should also lower the data rate, say to 1 Mbps, this reduces the TX/RX switching times a bit. It might also be possible to transvert down to the unused 600 to 700 MHz UHF TV frequencies. You could use those cheap, high gain UHF TV antennas and scrap cable TV hardline. This design is for reference only, it hasn't been built completely yet. There are several quirks that will need to be worked out: the use of resistive isolation pads at various points, diplexer on the mixer's IF output, PLL loop filter values, and various switching voltages. It can be used as a start to the TAPR Summer 2003 PSR callout for 802.11b transverters. Since in most urban areas the 900 MHz band is actual worse than the 2.4 GHz band in terms of interference, it may be possible to use this as an IF rig for lowering long coax losses, or even further transverting to the 440 or 1.2 GHz bands. Hmmm.. 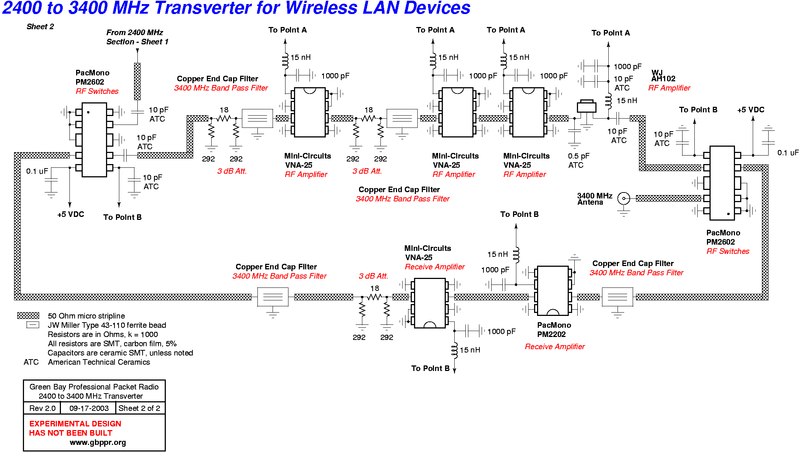 Theoretical transverter for converting Proxim frequency hopping 2.4 GHz wirelses LAN devices into the 1.2 GHz amateur radio band. Mixes the incoming 2.4 GHz signal with a 1.162 GHz local oscillator signal to convert down to the 1.2 GHz band. Reverse that for receive. No idea if it will work with regular 802.11b devices due to their fast switching times. This design is for reference only, it hasn't been built completely. There maybe a little local oscillator leakage, oh well. Should be using high side LO, but they are hard to build. 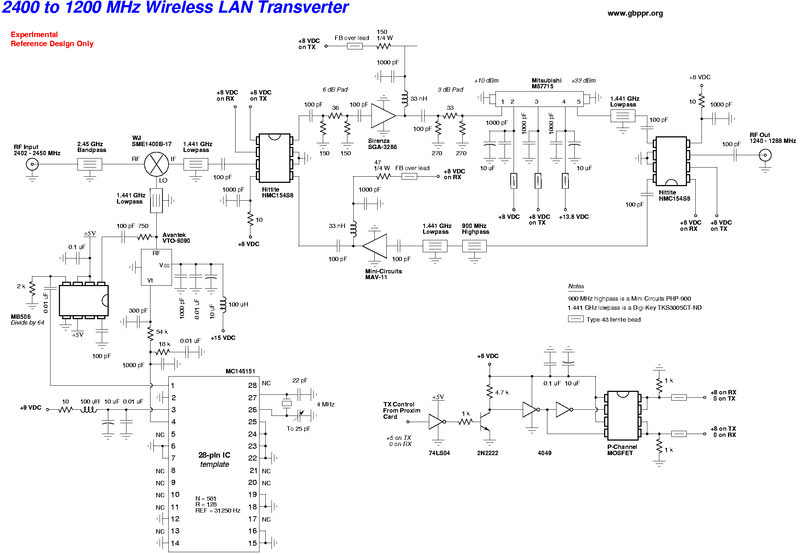 Theoretical transverter for converting Proxim frequency hopping 2.4 GHz wirelses LAN devices into the 3.4 GHz amateur radio band. Mixes the incoming 2.4 GHz signal with a 1.0 GHz local oscillator signal to convert up to the 3.4 GHz band. Reverse that for receive.